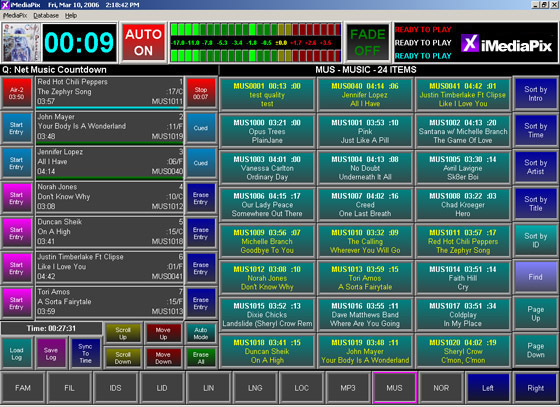 Radio doesn't stop at just a terrestrial broadcasting - iMediaTouch's optional modules expand your systems abilities with innovative and time saving software solutions. Our optional modules offer you some great solutions for automatic content importers, remote voice tracking capabilities, internet revenue solutions and live assist tools to make your radio stations even better. iMediaTouch optional modules enhance your experience and create an even more simplified workflow for your staff. If you have any questions about our optional modules please contact our Sales Team. Control and transfer assets automatically from a variety of sources! The iMediaImport Module automatically imports station content from a variety of sources - just configure iMediaImport and you will never have to manually download or transfer content again. iMediaImport will distribute content to designated database folders utilizing the popular "Cart Chunk" and id3 Tagging systems. 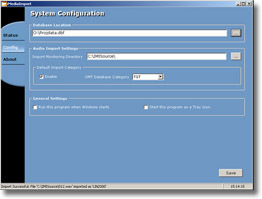 Users of iMediaImport can have any content automatically placed and titled into their iMediaTouch system. 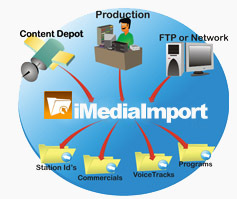 The illustration above shows an example of how iMediaImport receives and distributes content from a variety of sources. iMediaImport will save you time! 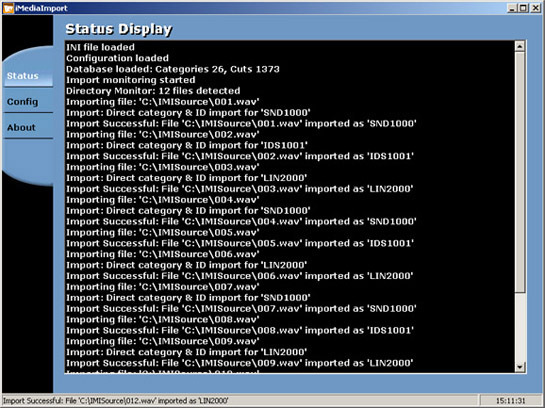 Just set the module to monitor the location of the content you need to import. 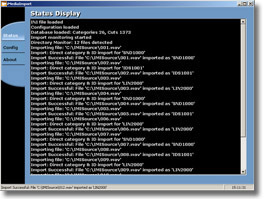 iMediaImport will distribute for easy retrieval into your iMediaTouch System. iMediaImport helps stations share content on a whole new level! 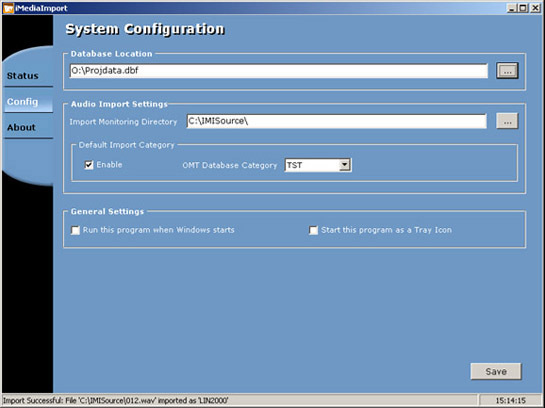 Control and transfer assets throughout any station cluster! 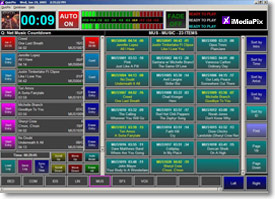 iMediaAccess provides a wide area connectivity strategy for radio groups. 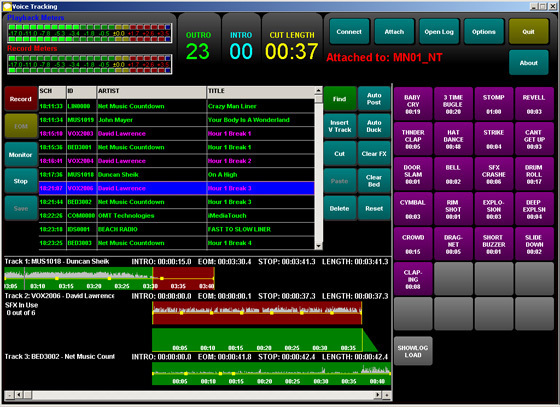 Providing a highly interactive remote interface to single stations and station clusters, iMediaAccess features content, scheduling and operational management functions. The system architecture and flexibility of configuration are the key advantages of the iMediaAccess system over most competitive offerings. While other systems provide remote access features, none come close to the configuration flexibility and user interactivity of iMediaAccess. iMediaAccess delivers enhanced operational efficiency by allowing staff to manage stations over wide geographic areas. Staff can be concentrated at head office or strategically distributed in geographic regions to control programming content, commercial traffic, daily schedules and operational management. 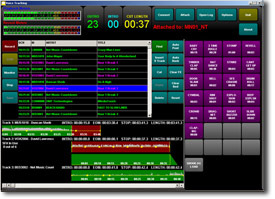 A simple, yet powerful iMediaTouch module, iMediaPix is ideal for your live assist operations needing commercial, ID and promo solutions. Browse an infinite number of categories, create logs for your broadcast day or load up a great playlist for your morning show – iMediaPix is the all-in-one simplified solution for radio. Perfect for news applications, morning shows or other personality intensive radio shows, iMediaPix puts digital audio at your fingertips and lets you put it on the air instantly. 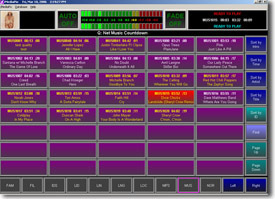 One iMediaPix does the work of a hundred "button boxes" at a fraction of the cost. Talent can play pages and pages of overlapping cuts hot, or load the cuts in the 7 event cut player. iMediaPix also features a page filled with 40 instant-start hot keys.